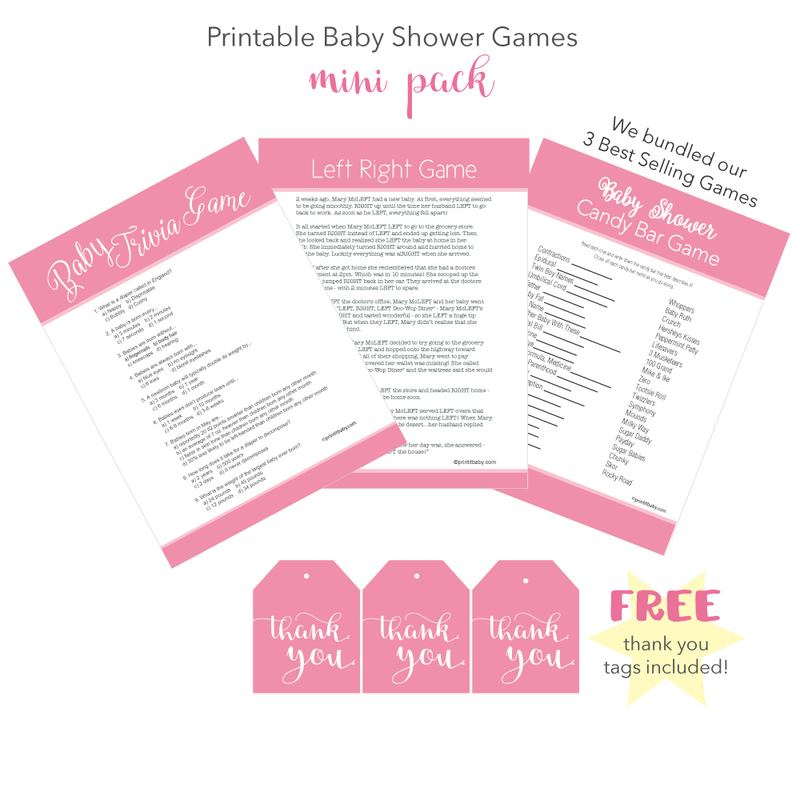 Baby Shower Games For Girls and Cute Girly Prize Ideas! Games For Girls ... & Favors Too! 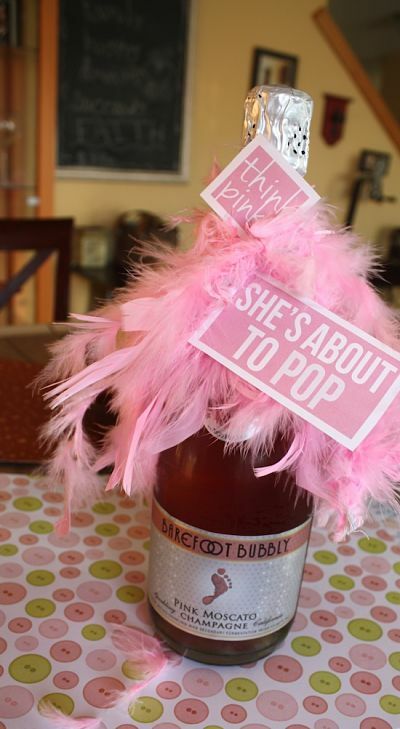 We put together a few of our favorite baby shower games for girls. Think Pink! and have a blast! 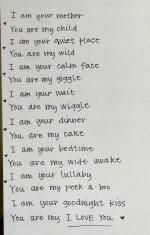 Baby shower games don't have to be stuffy and uncomfortable. 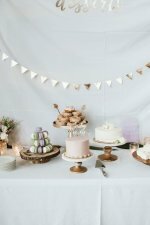 Below are some unique and creative baby shower games and prizes to help with your planning - and liven up the party! click to see where you can get this game. 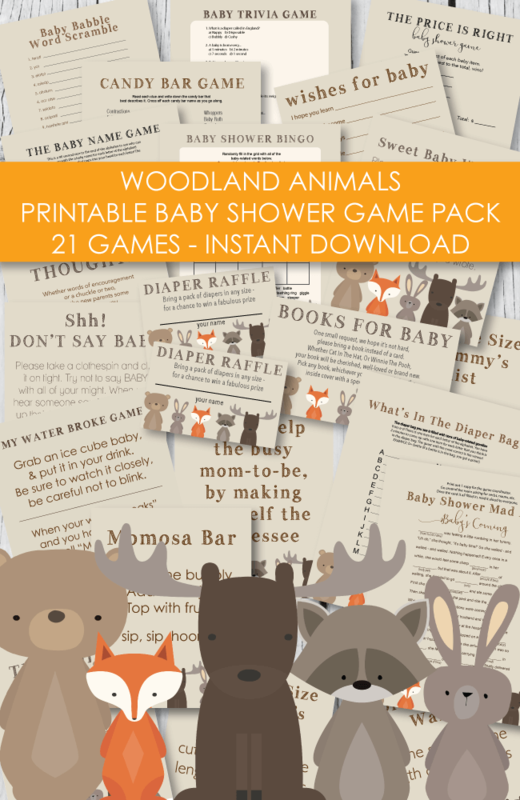 Grab our fun, printable baby shower game pack to make your planning a snap! We bundled our 3 top selling games and even threw in some FREE favor tags for you! 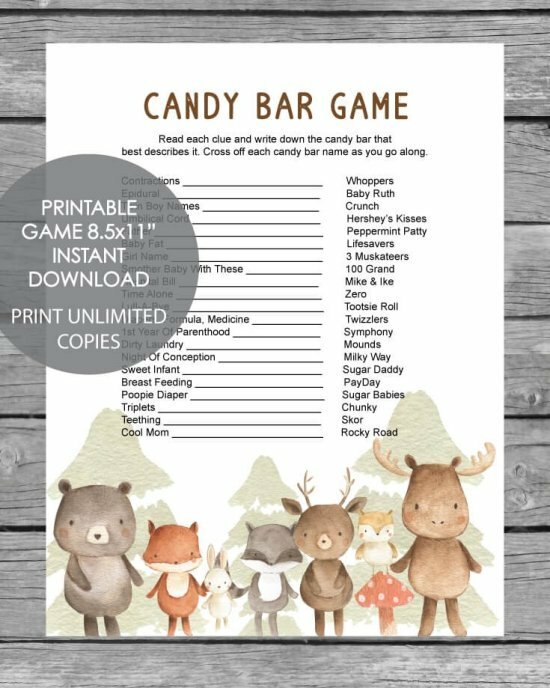 Print and play - so easy! click to see where to get this game. This is a silly, lighthearted game that will be sure to bring some laughs! Hand out a diaper to each guest as they arrive. After everyone has gotten to the shower, have them open up their diapers and the guest with a "dirty diaper" (a small brown spot in the diaper), wins a prize! Comes in pink and blue. 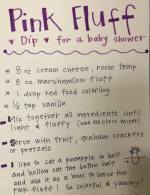 This awesome and clever baby shower prize idea can be found over at WrightByMe. 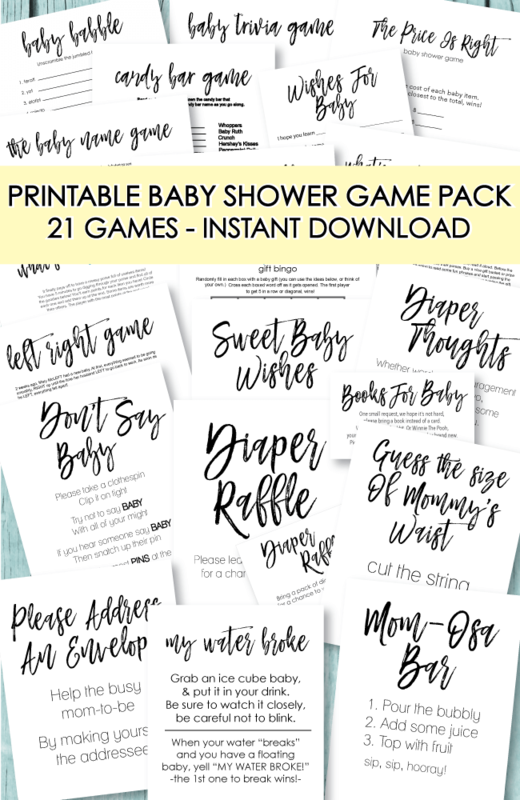 All you do is figure out how many prizes you will need for the baby shower - maybe 3-4 depending on how many games you decide to play. Then make up some of these cute mason jars filled with manicure/pedicure supplies such as: nail polish, a nail file, cute nail stickers, clippers, mini polish remover and cotton balls. Award big winners for their accomplishments by saying, way to go - "You Nailed It!" I loved this idea so much that I whipped up some FREE prize tags to tie around each jar. Get them here. 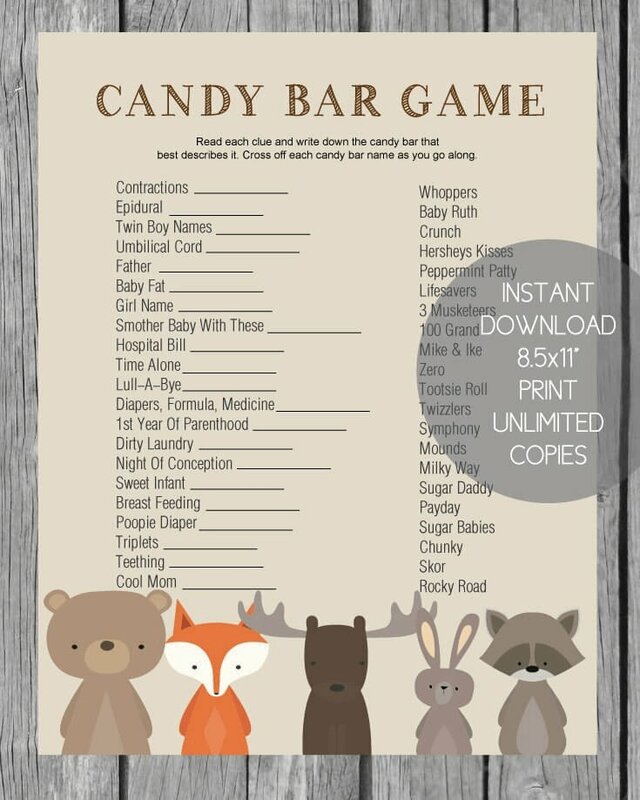 This is a top baby shower game to play! 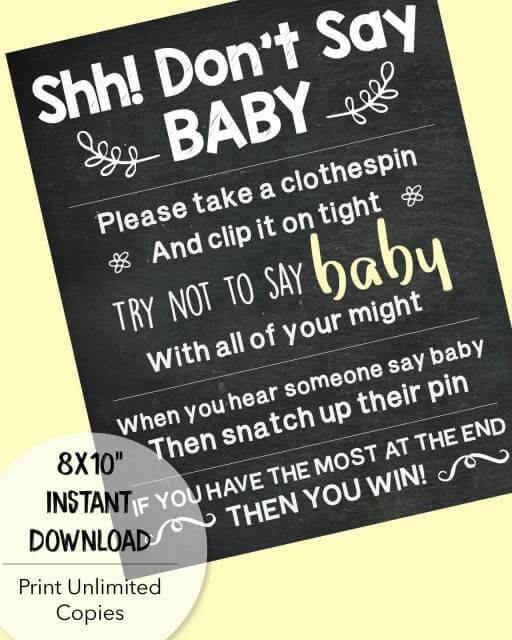 Hand each guest a clothespin or a cute pacifier necklace as they arrive - tell them they cannot say the word BABY. During the shower, if you hear someone say BABY, you get to take their clothespin or necklace! The person with the most clothespins or necklaces at the end of the baby shower is the big winner! 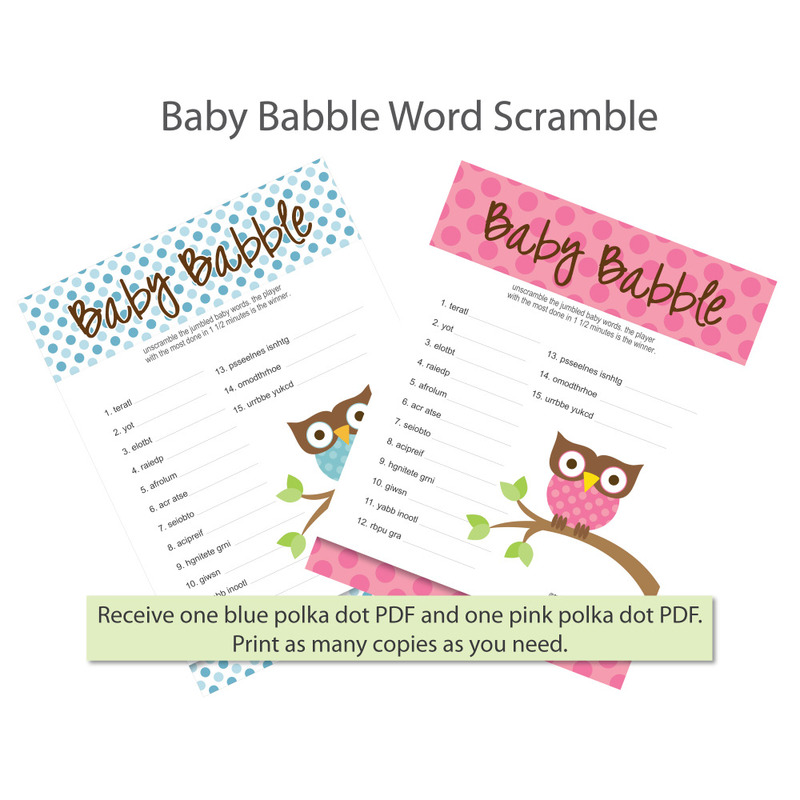 Hand out a baby shower word scramble game sheet to each guest - along with a pen and a hard surface to write on (such as a book or magazine.) Give guests 1 1/2 minutes to unscramble the mixed up words. The person with the most done at the end of the time is the winner! 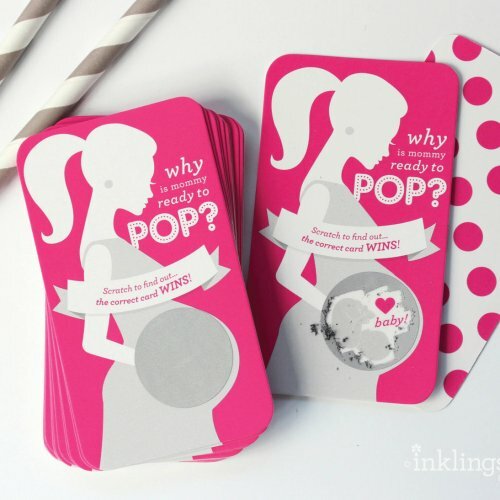 Head over to our main baby shower games page where you will find more clever games such as the popular baby shower purse game - "What's In Your Purse?!" A game that gives you points for having crazy items in your purse - the one with the most points at the end, wins a prize! The tutorial for these DIY baby shower prizes can be found over at our baby shower crafts page. 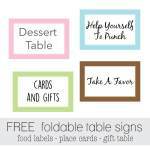 They are so easy to make and you can give them away as favors or prizes! I also made a free printable favor template of the purses so all you have to do is print them onto cute paper, cut them out and assemble! These homemade baby shower favors only cost around .30 each to make! 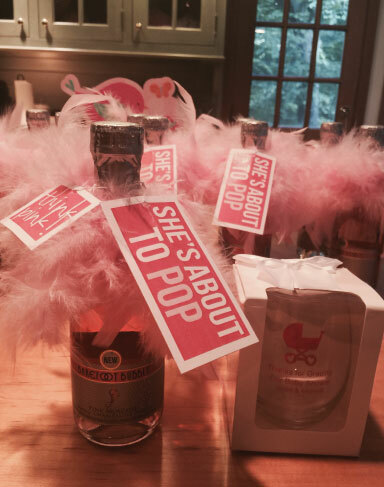 One of our sweet readers, Suzette, sent in this cute picture of our "She's About To Pop" & "Think Pink!" baby shower prize and favor tags in action! Suzette also gave each guest an adorable baby shower glass to go with the champagne - which is such a clever idea that we never even thought of! You can see the cute glasses here. 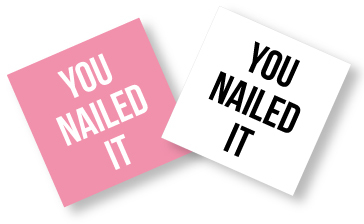 These make the perfect prize - simply print out the tags, cut and attach them to mini bottles of pink champagne! The favor and prize tags also come in blue for boys too! For the feathers, simply buy a few pink boas at the dollar store, cut them into smaller pieces and tie around each bottle! 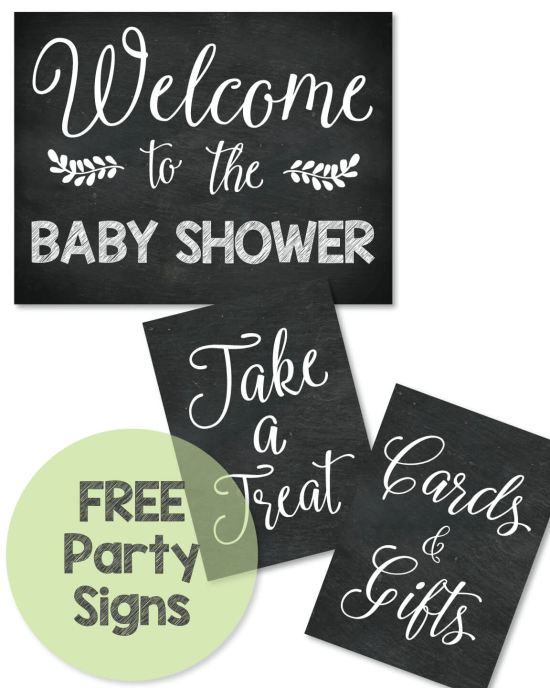 You can read all about these baby shower prize and favor labels here. 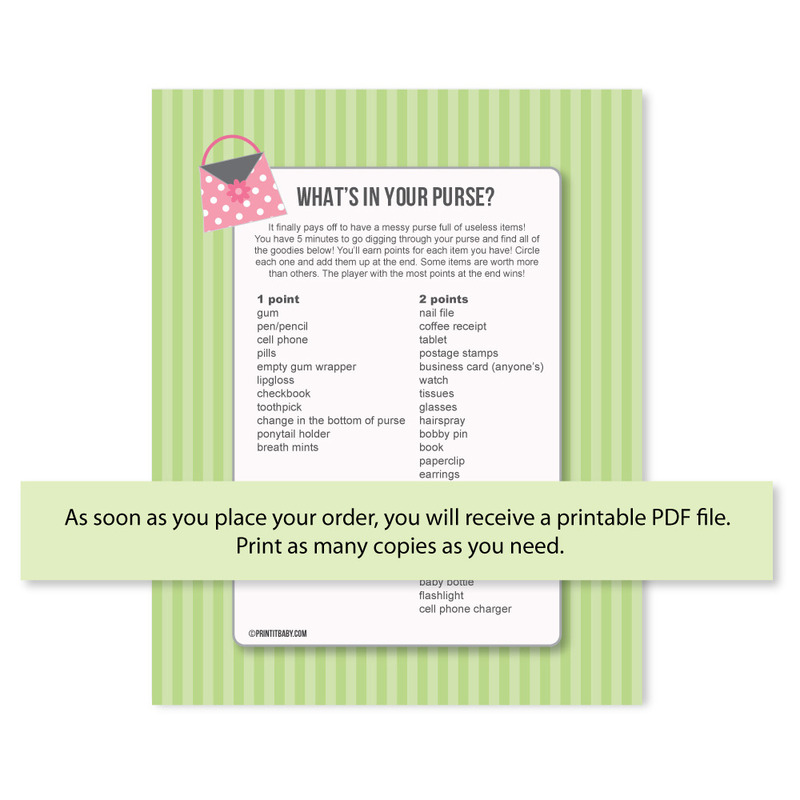 This is one of the most popular printable items on our site! So cute and so easy! 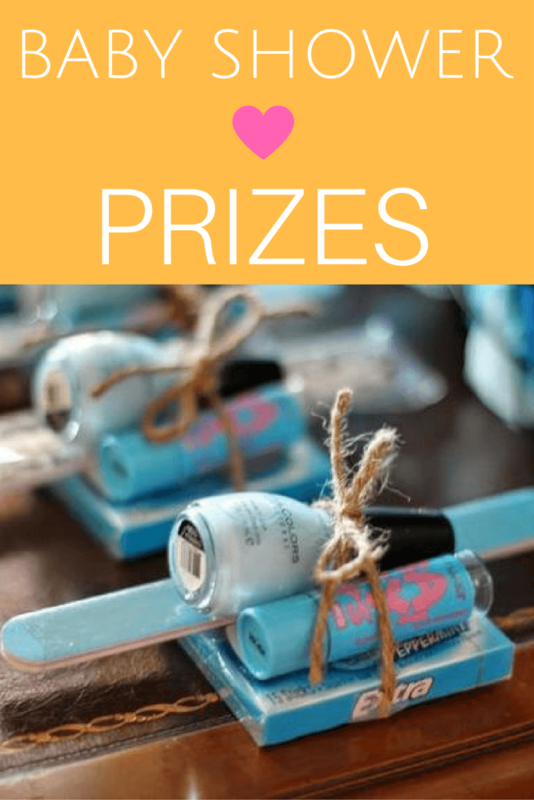 Guests will love these prizes and will be talking about them for months! 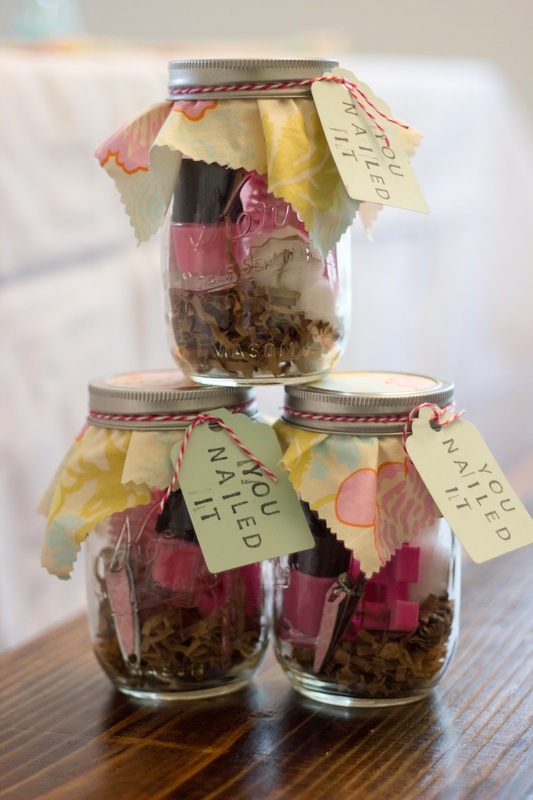 You can also tie the "Think Pink" labels onto pink jars of nail polish for another easy baby shower favor or prize idea!